Persistent dryness, scratchiness and a burning sensation on your eyes are common symptoms of dry eye syndrome. These symptoms alone may be enough for your San Diego eye doctor to diagnose dry eye syndrome. Sometimes, he or she may want to measure the amount of tears in your eyes. A thin strip of filter paper placed at the edge of the eye, called a Schirmer test, is one way of measuring this. Your eyecare practitioner may recommend artificial tears, which are lubricating eye drops that may alleviate the dry, scratchy feeling and foreign body sensation of dry eye. 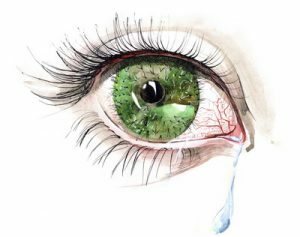 Prescription eye drops for dry eye go one step further: they help increase your tear production. In some cases, your optometrist in San Diego may also prescribe a steroid for more immediate short-term relief. Check the label, but better yet, check with your eye care expert in San Diego before buying any over-the-counter eye drops. Your eye doctor will know which formulas are effective and long-lasting and which are not, as well as which eye drops will work with your contact lenses.